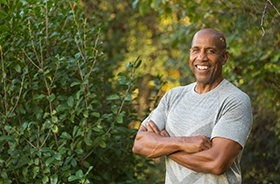 Tooth loss is a problem faced by over 120 million Americans every day, and if this includes you, then you’re probably well aware of the problems missing teeth can cause. Your food choices can become limited, speech can start to feel awkward, and feeling confident enough to smile just doesn’t happen. If you’re ready to finally have your complete smile back, then Canal Side Family Dental can give it to you with dental implants. Why Choose Canal Side for Dental Implants? 2 Outstanding Aesthetics & Longevity – Enjoy New Teeth For Life! Your new “teeth” will be virtually seamless from every angle, including aesthetic appearance, overall feel, and day-to-day function. Dental implants don’t require any overcomplicated maintenance routines – they can be cared for just as you would natural teeth. 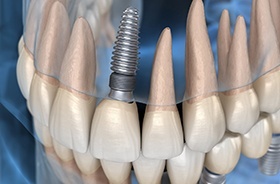 The longevity of dental implants is truly unmatched! With proper maintenance, they can thrive for several decades or the rest of the patient’s life. One important benefit of dental implants is their versatility. Whether you’re missing a single tooth or a full arch, this state-of-the-art reconstructive service can be paired seamlessly with custom-made restorations and replenish the attractive, confident dental structure you need. For patients with a single gap in there smile, an implant-retained crown is highly recommended. A custom-made, all-porcelain crown can be attached directly to an implant root to create something that is indistinguishable from a natural tooth. And, unlike other replacements, this tooth won’t require support from the surrounding teeth and gums, making it a smart choice for your overall oral health. If a patient is missing more than one tooth in a row, replacing each one with an individual implant would likely be cost prohibitive. 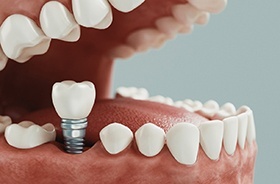 Fortunately, implants can also be used to support a strong and sturdy dental bridge. Two implant crowns are placed on either side of the missing teeth, and these are used to support prosthetic teeth to fill in the space. With this restoration, we can bring back full function to the smile while also preventing the remaining teeth from shifting out of place. Even patients who are missing all or most of their teeth can be good candidates for dental implants. Using a few strategically placed roots, we can secure a denture directly to the jawbone just like real teeth. 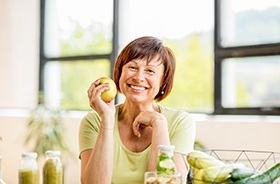 Compared to a traditional removable prosthetic, implant-dentures have a superior hold, are guaranteed to last longer, and they even help a patient have a much stronger bite, enabling them to enjoy a more varied (and likely healthier) diet. And, unlike other dental offices in the area, we can complete the entire procedure in-house. Our periodontist, Dr. Cho, is a certified expert when it comes to placing dental implants, and he’ll ensure you’ll enjoy a pain-free process and smooth recovery. Once you have healed from placement, our team can attach your new teeth to the prosthetic roots, bringing your smile back for a lifetime to come. Dental implants are actually quite versatile and can reliably replace any number of missing teeth using the restorations detailed below. Which one is right for you? Our team can help you decide at a dental implant consultation. 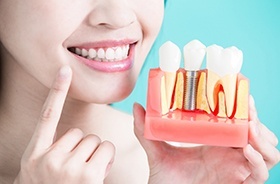 Of course, one of the most common questions we hear from patients interested in dental implants is “what will this cost me?” There are several different components of the dental implant procedure that all incur different prices, including the initial surgical implantation, the possible placement of abutments (connectors), and the style and number of customized restorations needed. No two patients’ needs are exactly alike, which is why we won’t be able to provide confident pricing information until after your initial consultation. Rest assured, though, that your financial obligation will be laid out in clear, comprehensive terms before any actual procedures are scheduled. At first glance, dental implants can seem like a significant investment of time and money. However, we believe that the eventual benefits will meet your needs and easily exceed your expectations. 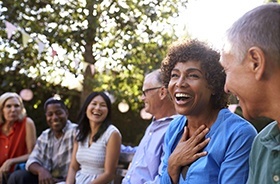 While more traditional tooth replacement options usually require costly repair and replacements over the years, implant-retained teeth are designed to thrive for decades or even the rest of a patient’s life with very minimal maintenance. This means that you may end up paying less in the long run!